Vodka & Equations: Rocket Mass Heaters. Not actually a rocket mass heater, but the best picture I could find. Source. My blog has been host to a lot of ranting posts lately, giving lots of opinions but not necessarily new or interesting information. In hopes that my blog does not devolve into a constant series of complaints and opinions, please adjust your monocles and top hats, and discover the fascinating world of rocket mass heaters! Imagine, if you will, a woodstove. These usually consist of a combustion chamber (usually somewhat decorative), and a chimney that goes upwards, perhaps winding so as to distribute heat evenly in the upper levels of a home, and then exiting vertically from the roof. The problem with this setup, even with more efficient models, is that it is rather wasteful. The hot exhaust gas from the roof is a carrier of heat that could have been used in the home. Further, the smoke that is usually generated represents not only pollution, but also impure combustion. This post on garbage incineration discusses this issue as well. Smoke contains, among other things, carbon monoxide and carbon particles, pollutants that could ignite under the proper conditions and concentrations. For the record, I am not suggesting that the world will explode if everyone used woodstoves (though you can get chimney fires this way), I only intend to highlight the wasted combustible material. Below I shall post the solution to this waste. I usually try to avoid linking to non-public-domain sources [aka "Wikipedia"], but this page gives the best illustration of the physics involved that I could find. The primary advantage to this setup, known as the rocket mass heater (RMH), is the "super rockety reburn combustion chamber." It traps the ash and smoke in the same place as the heat of combustion, leading to the burning of the impure combustion products. Not only does this generate cleaner exhaust, but there is no lost heat in the form of smoke. The second benefit of this design is that the exhaust usually snakes through a large mass. This is usually cob, but others have been made using sand and brick designs. The larger this mass, which is often formed into a bench, the more heat can be captured from the exhaust. 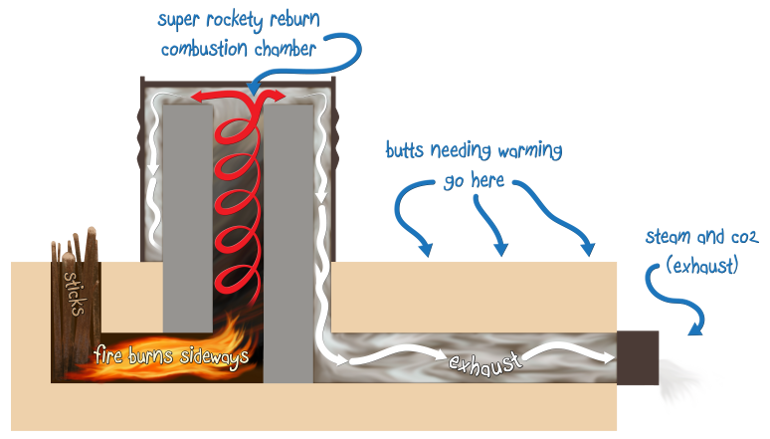 The mass can then retain and radiate heat hours after combustion has stopped, keeping the heated space warm. Of course, more efficient burning means less fuel is needed overall. It would seem that many users report needing less than one cord of wood for a winter where they would usually burn 3-5 with a conventional woodstove. Naturally, home heating is only one of many possible functions. Greenhouses may be heated efficiently with such a design, and the picture leading this post shows a makeshift hot water heater. Designs without the large mass and featuring a hole at the top of the combustion chamber are known as rocket stoves, and are a very efficient way of boiling water or cooking food. On a personal level, I am very curious as to how burning switchgrass or biochar might work. I have only scratched the surface of this topic, and it appears that it is a fairly new idea, given the size of the Wikipedia article on the topic. However, I actively encourage you to seek out information on the topic, I am certain it could lead to a more sustainable future, and endless fun in the form of do-it-yourself projects. P.S. Thanks to my darling girlfriend, the brewer of the Turkish coffee that fueled this post.